Behind the Ed has been revived! That's right the gossip you loved has made a comeback. Sadly Sports-Ed will no longer be a section. We also have another Ask The Editor question this week. So here is Issue 32! Strange reports have been coming in claiming that the JBC has installed some sort of camera system to monitor the events of the Culde-sac. I can safely say that this is just a rumor. Just because we just launched another satelite and have been putting up camera like mechanisms doesn't mean that we have or will have cameras installed in the Culde-sac. The JBC asked all residents of Peach Creek to dismiss this as a rumor as the JBC would never intrude on your privacy even for a juicy story. As for the satelite launched it was just a weather balloon. To make sure that the residents understood that these were rumors I, myself went out to talk to a few people. Rolf: What are with these swivel boxes!? Justin: I'm not sure I understand what you're talking about. 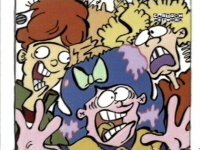 Rolf: Are you trying to steal Rolf's soul?! Justin: Rolf I assure you there is no such thing as cameras hidden in the trees,telephone poles, and homes of Peach Creek. So there is no need for the residents of Peach Creek to even be slightly worried. So just go about your business and just forget that we're watching you. Deadly Virus Near Peach Creek? -Are you having trouble breathing? -Is the square root of 4, 2? -Do you feel like you can fly? -Has the feeling only started recently? -Are you filled with an uncontrollable urge to destroy all humans? If you answered any of the above questions you are probably infected and should report to the JBC immediately. Now that I have settled into my new desk, and have changed sections here at the JBC. I have come accross several files going through the archives here at the JBC. There was alot of information that I found, about the JBC, the Eds, and the other members of the cul-de-sac (You wouldn't believe how many involve lawsuits with Dr. Eric). With this information in hand I'd like to present you with the first installment of Behind the Ed. Amongst the several files I found in the archives, including the ones about all the jokes the staff makes about the freelancers, one I thought was pretty interesting. We all are well aware of the Eds failure to deliver a mass amount of newspapers. However you didn't know that after the fiasco, in order to pay off the debts from all those papers, Edd made several more paper delivery machines commissioned by none other then the JBC's editor, Justin. When approached on the issue Justin had this to say, "As I said before the money that would go to your paychecks goes towards useless stuff." He was then chased by a chihuaua and locked himself away. So without permission I entered into the basement of the JBC, in hopes that I may find these missing pieces of technology. While down there I found yet more lawsuit files against Dr. Eric, and the freelancers chained together working the printing press. But the delivery system continues to elude us. My investigation for the machines lead me to Dr. Eric. I asked him if he knew anything about them, to which he told me to check the fridge, which I ignored and shut the door to his closet/office. Without any helpful information it'd seemed like I was out of options. That is until I remembered that Edd was the one who built them in the first place.I sat down to ask Double D a few questions on the topic. Johnathan: So, you once were commissioned by the JBC to build 7 paper delivery systems, is this true? Edd: Yes, I really needed a way to pay off the newspaper company before I had to write a note to my parents explaining myself. Johnathan: Do you know where these machines are right now? Edd: Actually after seeing the disaster caused by the bed being loaded inside, Jusin paid me twice as much to convert them into defensive cannons in the security system. Johnathan: Thank you for your time Double D. After paying off Eddy for the two minutes of Edd's time I made my way back to the office. I went back to the basement and tried to find the old controls for the JBC security system. After uncovering them I read the manual which was no help because I no habla el spanol. When I finally figured out that the joystick aimed the crosshair I was set. I tested it out on Blake just to see how powerful it was. I won't describe his injury but I will say get well soon! Jimmy was recently taken away by the Eds for attempting to steal shoes from local Culde-sac homes. He was caught on tape stealing shoes. Don't ask us how there are cameras in the Culde-sac now. This incident occurred when he was caught while the kids were playing Hide and Seek. Let's play the dialogue again: "Ooo!!!! Nice Shoes." At that point, he was taking shoes from the closet of local teen Nazz. Jimmy has been charged several times since because more of these mischievous deeds have occurred. Nazz reported some of them. Why did Jimmy do it? Jimmy refused to comment to the JBC, But sources he loved the shoes the cul-de-sac had. Well, it seems we in the cul-de-sac are in a predicament. At lest Jimmy can't steal right now. We'll make more updates as the story unfurls more. Recently EDCO released the EDCAM last Friday. The JBC purchased one yesterday and this thing is pretty useful. The camera has about ten things that it can do from video camera, digital camera,web cam,laser beam, and more! So far EDCO has sold around two hundred units. After playing around with it for about an hour or so we started to notice that the camera isn't meant to survive falls from high places, being submerged in water, being hit with a baseball bat, and other activities. So if you need a camera that can take damage don't buy the EDCAM. This is probably the first product that I would recommend on buying. It's features alone make it the perfect gift for anyone. So the JBC gives the new EDCAM by EDCO four rubber bands out of five. +It has a laser beam! Are you looking for a cheap cleaning service and not worried about quality? Do you need something cleaned up fast without too many questions? Well then Ed's Cleaning Service is cleaning crew you need! With cleaning prices starting at 25 cents its no wonder this is the most preferred cleaning service in Peach Creek. So hurry and call today at 467-9987! This weeks Ask The Editor comes from Plankfan99. On Take This Ed and Shove It episode when Eddy finally figures out he is old,does anybody else think that this the most emotional part of any episode? You must already know this was scheduled to be the final episode and the creators wanted to add a twist to the series. However, with high fan input and great viewing numbers the creators decided to add more seasons. As far as most emotional I would have to say the episode where Ed realizes he is Ed. "I am Ed!" This scene brought a tear to my eye because he has finally figured out not only who he is as a person but who he is within himself. This could be a reference to the quote "I think therefore I am." But none the less the episode was still pretty good. I still find the best scene in that episode to be when Ed mentions the loss of control is the first thing to go.